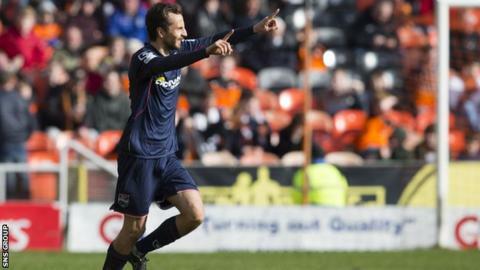 Ross County's Raffaelle De Vita is the Scottish Professional Football League player of the month for March. The 27-year-old Italian midfielder moved to the Dingwall club in late January and has been influential in the Staggies' excellent run of form. The Highlanders are yet to lose a match in which De Vita has featured, winning seven out of eight. He scored twice in February and grabbed the winning goal in this month's 2-1 victory at Dundee United. County manager Jim McIntyre was given the manager of the month prize for March and February, having steered his side from last place in the Premiership to 10th. They remain only three points above the play-off spot ahead of Monday's trip to Paisley to face bottom side St Mirren.